It's Super Bowl Sunday, Sunday, Sunday inbound marketing nation! 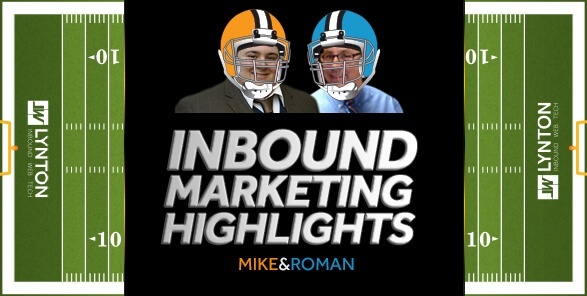 Welcome to Sunday Inbound Marketing Highlights with Mike and Roman - our enhancement to The Friday Five: Five Headlines from Social Media, Inbound Marketing, SEO, and Web Design, With the addition of our Friday Fails, we still felt that key curated industry headlines from the past week would be valuable to you. And that's how Sunday Inbound Marketing Highlights was born. Use your day of rest to unwind and catch up with our weekly inbound marketing highlights! Could This Headline Technique Double Your Click-Throughs Too? Super Bowl Ads 2014: What Does $4 Million Really Buy You? We all get stuck sometimes and lose our creative mojo. What's that all about Alfie? Read this article to help you crush through writer's block. Points 3 and 4 are good ones. Writing is a habit. The more you do it, the better you get at it. What's the technique? You want to find out, right? Should I give you a hint? Do you think I might have already given you a few hints? Need a BIGGER hint? "A Question Headline must do more than simply ask a question, it must be a question that, according to Bly, the reader can empathize with or would like to see answered." Bigger isn't always better. Remember David and Goliath? Ok.
"Not surprisingly, Simply Measured's analysis found the Interbrand 100 have more followers and retweets than the smaller companies. However, the larger brands are also posting more often to Twitter: They tweeted 12 times a day on average in 4Q13, compared with three times daily for the smaller companies." Key word - analyze. We have "big data." But that's all it is - data. Data that needs to be vetted and poured over by humans and made sense of. Good piece on the need for this. Well, if you decide against the Super Bowl ad buy - you can reinvest that money into 17 years of inbound marketing - let us show you how. In fact here's some food for thought. Make it a great Super Bowl Sunday inbound marketing nation! See you next week.